Qualcomm's Snapdragon 810 chipset is clearly faulty, as many benchmarks confirm it. HTC One M9, which is equipped with this particular SoC, had major overheating issues before it hit shelves, but the Taiwanese company delivered a small software update that partially solved the problem. Basically, the update throttles down the CPU and GPU speeds in order to avoid overheating. While the solution solved the reported overheating issues, it drastically reduced the HTC One M9's performance in benchmarks. HTC also had to release another software update to keep the One M9 cooler while it charges. For whatever reason, the smartphone would overheat while charging even though the Snapdragon 810 processor shouldn't have been used that much during this task. All the issues that HTC One M9 had with Qualcomm's Snapdragon 810 chipset are present in all devices powered by this processor. Even though the chipset maker does not wish to admit that Snapdragon 810 has major overheating issues, real-life tests confirm it. 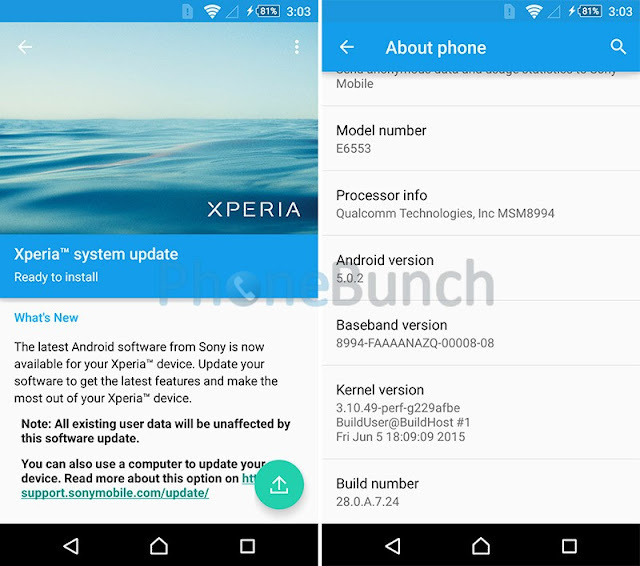 Sony Xperia Z3+ is another flagship smartphone that uses the Snapdragon 810 chipset. We have already reported about the handset's major issues with the camera app, which closes down due to increased temperatures. The same goes for any hardware-demanding app that users ran on the Xperia Z3+. Sony is already aware of these issues and promised to deploy a software update, just as HTC did. However, it's been almost a month and Sony has yet deliver on that promise. According to a new report, the Xperia Z3+ is now getting a new software update that supposedly fixes these overheating issues. The update is about 70MB in size, but we can't yet confirm that it does address the overheating problems, as Sony has not announced anything on that matter. If this is indeed a fix for the overheating issues in Sony Xperia Z3+, then expect your smartphone to score lower in benchmarks because it's the only way to solve these problems.